Kali Phos 30C 1 oz with 680 pellets 15% SALE Kali Phos in a higher 30C potency for help with difficulty concentrating. Mental fatigue, problems focusing. Stay calmer, alert in the day and sleeping better at night. Kali Phos has often been referred to as the pick-me-up remedy. And with good reason. Kali Phos is from the mineral Potassium Phosphate, an important electrolyte that is crucial for energy-mental and physical. Potassium supports the adrenals, so is helpful for stressful times that can overtax the adrenals. Kali phos is helpful for tension headaches associated with intellectual fatigue. Kali Phos is safe for stress of teenagers and adults. Use prior to exams or presentations for a clear mind. Nervous headaches with indigestion. Mental fatigue with irritability. Jet lag and motion sickness, take prior to traveling and following few days. Kali Phos is from the mineral potassium phosphate. Also known as Kali Phosphoricum. Economy 1 oz bottle with 680 pellets- that's over 9 times more pellets than multidose tubes! Aurum Met 30C economy 1 oz with 680 pellets 15% SALE Aurum Met is useful to lift depression, despair, and lack of confidence. Aurum Met is useful for depression following traumatic events that cause loss of self-worth, moodiness, sadness, feelings of self-destructiveness, and apathy in work, hobbies, etc. Aurum Met is beneficial for circulatory concerns such as blood pressure. Blood pressure from stress, work, anxiety. Aurum Met is used for relief of depression, anxiety, and stress. Physical symptoms that worsen from emotions. Sensitivity to pain, cold, yet better with fresh air. Use Aurum Met as an add on therapy for Post Traumatic Stress Disorder / PTSD, and hypervigilance. John of Placerville, CA writes in his testimonial of how Aurum Met helps to "even out irritability, anxiety, and moodiness". Aurum Met is from the mineral gold, particularly known for its emotional benefits for people suffering from a profound loss of self-worth, where everything is perceived through a veil of worthlessness and hopelessness. Aurum Met is used return self worth and sense of safety in one's environment. Aurum Met can be used as an adjunct therapy guilt complex, melancholy, vascular hypertensive erethism, palpitations with congestive flushing in the head and chest. Aurum Met is useful in emotional situations that are worse from alcohol or substance abuse. The Dictionary of Practical Materia Medica lists under Aurum Met, "...Nostalgia, hopeless, feels that all is against her, the least contradiction excites his wrath." Causes are listed as grief, anger, disappointed love. Aurum Met relieves morning exhaustion, palpitations, and congestion. Insomnia, person can't sleep til 4 am. Aurum Met supports the heart and circulatory system. Used for blood pressure concerns. Anxious palpitations. Aurum Met is also known as Aurum Metallicum. SUGGESTED DOSE: 3 pellets at one time as one dose. Repeat 3 times a day. Dose less frequently as improvement is made. Economy 1 oz bottle, 680 pellets for 225 doses- that's over 9 times more pellets than multidose tubes. Stramonium 30C economy 1 oz 680 pellets 15% sale Stramonium supports the circulation system. Use Stramonium for various circulatory problems. Stramonium 30C is used for fatigue, blood pressure, arteriosclerosis, heat stroke, and sun headaches. Stramonium is useful for emotional health concerns such as emotional fatigue, anger, and mood swings. Stramonium is useful for irritability and other symptoms that may be associated with ADD, ADHD. Stramonium can help calm anger and irritability in teens, men or women. Stramonium 30C can help for both physical and emotional symptoms from PMS and menopause. Use Stramonium during the day for stress relief. One customer says Stramonium "centers" her. Use Stramonium at night to quiet the mind and relieve insomnia. Stramonium may help children with bedtime fears. The book, The Problem Child and Homeopathy by Gupta, lists Stramonium as helpful for the child who steals, strikes out, is destructive and malicious. Stramonium supports the circulatory system and improves muscular mobility, hypertension, Parkinson's. Kent Repertory lists Stramonium for facial twitches associated with Tourette Syndrome. SUGGESTED DOSE: 3 pellets 3 times a day. Use with less frequency as improvement is made. Economy 1 oz bottle, 680 pellets for 225 doses - that's over 9 times more pellets than multidose tubes! Ignatia 30C economy 1 oz 680 pellets 15% sale Ignatia is especially suitable for emotional upsets and depression from grief. Helps with short or long term worry. Grief from illness or death of a loved one. Indicated for onset of high blood pressure from grief, shock, disappointment. Emotional symptoms of depression, sadness, anger, disappointment in love. Ignatia helps with Nervousness due to everyday stress. Mental symptoms may include sadness, involuntary sighing and moodiness. Headaches due to emotional stress, or cigarette smoke. from analgesics, rebound headaches from caffeine, or sinus headaches. Cold: Helpful for a cold that usually develops a lump-in-the-throat sensation or a spasmodic cough and much sighing. Emotional Strain: Useful for emotional strain that leaves the person mentally & physically exhausted. Physical symptoms from emotional upsets such as restless sleep, waking up frequently, long and troublesome dreams (Hahnemann says of Ignatia, "...is best administered in the morning. Fever: Helpful for a fever that is likely to be very chilling and may make you quite itchy now and then. Grief: Beneficial when sleep is disturbed and restless marked by sighing and nightmares. Disappointment, Contradictory symptoms, worry, shock, lump in throat. Sad, sighing, moody, changeable. Headache: Helpful for headaches especially when leaning over, as if nail is driven through side of head or after emotional upset. Hysteria: Useful for the rapid alternation of mental and physical states. Person seems hysterical even to the point of vomiting. Indigestion: Helpful for indigestion with a series of hiccups. Cramps and that sinking-in-the-stomach feeling dominate. Intolerance Of Tobacco: Headaches from use of tobacco products. Modalities include feeling worse in the morning, feeling ill from strong odors such as coffee, tobacco smoke. Worse being in cold air. And person may feel better bending forward or with firm pressure. Also known as Ignatia Amara. #6 Kali Phos 6X 1000 tablets 10% off SALE! Kali Phos, #6, improves potassium utilization for mental clarity, mental and physical energy. Kali Phos is the remedy for nervous energy, worry, problems with concentrating, mental fatigue. Stay calmer and more focused in the day and sleep better at night with Kali Phos. Kali Phos has often been referred to as the pick-me-up remedy. And with good reason. Kali Phos is from the mineral Potassium Phosphate, an important electrolyte that is crucial for energy-mental and physical. Potassium supports the adrenals, so is helpful for stressful times that can overtax the adrenals. Kali phos is helpful for tension headaches associated with intellectual fatigue. Kali Phos is safe for stress of teenagers and adults. Use prior to exams or presentations for a clear mind. Nervous headaches with indigestion. Mental fatigue with irritability. Jet lag and motion sickness, take prior to traveling and following few days. Use Kali Phos before dental trips for less anxiety. Use Kali Phos irritable youngsters, strong willed kids, and ADD concerns. Kali Phos may be helpful for jet lag and motion sickness, take prior to traveling and following few days. Kali Phos may also be known as Kali Phosphoricum, and is the homeopathic Cell Salt from the mineral potassium phosphate. Kali Phos is one of the 12 Homeopathic Cell Salts also termed Tissue Salts or Biochemic Salts. We sell the original Schussler's biochemic Cell Salts, instant melt tablets. Cell Salts means minerals for cell health. Biochemistry developed by Dr. Schussler is use of minerals in homeopathic potency. Cell Salts are used successfully because minerals are the foundational nutrition for the body's enzyme activities and energy cycles and Cell Salts are instantly bioavailable. Retail value $21, 10% off SALE, $18.59. Lac Maternum 30C 1 oz with 800 pellets Lac Maternum is helpful for free floating anxiety and worry. Lac Maternum may be thought of as an emotional balancing remedy. Lac Maternum helps with anxiety, sadness. Lac Maternum helps to feel more grounded and centered, more accepting of self and accepting of relationships. Lac Maternum improves mental clarity. Lac Maternum may be helpful for issues since birth. Safe for young children to use as part of health plan for separation anxiety. People reported that floating sensations, airiness, dizziness, the muddled thinking, fainting were gone after using Lac Maternum. With Lac Maternum, you are more able to say ‘no’ to other people and have proper boundaries, improve insecure feelings. Physical complaint benefits include; help with headache, migraine, dizziness, vertigo, an empty feeling, flushes, loss of hair, lack of energy in the lower body, coldness of the extremities, weak libido, lack of feeling, awkwardness and general chilliness. The unawareness of one’s frontiers leads to skin conditions such as eczema, psoriasis, molluscae, etc, the skin being the margin of the physical body. This makes Lac maternum a very effective remedy against skin diseases. A special remedy potenized 30C mother's milk (9 women-colostrum to 10 months). Since mother's milk is our first food, Lac Maternum is a remedy for eating disorders. 1 page Dosing Guide included, written by Kathryn Jones Health Counselor. This guide offers information for starting dose and maintenance dose. Tips on how to correctly adjust dose and when to stop dosing. For personalized dosing, assessment of dose effectiveness, dosing for children, please order the Dosing Consultation. 1 oz with 800 pellets for 265 doses. Ingredient is Lac Maternum 30C, pellets are in base of sucrose and cornstarch. Aurum Met 200C economy 1 oz bottle with 680 pellets Aurum Met is useful to lift depression, despair, and lack of confidence. Aurum Met is useful for depression following traumatic events that cause loss of self-worth, moodiness, sadness, feelings of self-destructiveness, and apathy in work, hobbies, etc. Lithium Carbonicum 30C 1 oz 680 pellets 15% SALE Lithium Carbonicum also known as Lithium Carb or just Lithium is for nervous system support. Lithium Carbonicum is useful for emotional imbalances such as bipolar disorder and depression. Lithium Carb is listed for symptoms of Essential Tremors. Lithium Carbonicum can be safely used along with other therapies and medications without interaction. Lithium Carb is used in homeopathic form to get into the system faster and avoid the many side effects such as shaking, dizziness, weight gain, etc. that is experienced when taking the prescription lithium. Cocculus Lightheaded Combo economy 30C 1 oz pellets Cocculus Lightheaded Combo for vertigo, headaches, and balance problems from inner ear concerns. Cocculus Lightheaded Combo can be used for illness, injury, or age related symptoms connected to imbalance issues. Use Cocculus Lightheaded Combo for Meniere's Disease for natural support. Cocculus Lightheaded Combo is a unique formula to Elixirs.com. Cocculus Lightheaded Combo is a blend of Cocculus, Conium, and Petroleum in 30C potency for stubborn and chronic symptoms. Use Cocculus Lightheaded Combo as a substitute for the Heel Cocculus Compositum product. Cocculus Lightheaded Combo can be used along with your health plan for Ménière's, hearing issues, spinning room sensations, and balance problems. "Your Cocculus Lightheaded Combo works very well, so I'm buying more. Thank you". K.F. CO.
*Petroleum is included in Cocculus Lightheaded Combo for tinnitus symptoms, ringing, cracking, buzzing, tinkling, roaring, rumbling in ears. Petroleum for balance problems upon rising or bending over. Petroleum is listed for veritigo, swirling motion. Petroleum is listed for brain fog, fulness in head. Petroleum is listed for headaches of many types: Neuralgic headaches; occipital headaches; drawing pains in temples; forehead headaches, tension headaches, pulsing headaches including cerebellum. Cocculus Lightheaded Combo is offered as complementary alternative medicine (CAM). According to the government’s National Center for Complementary and Alternative Medicine (NCCAM), 38% of adults use complementary medicine. Integrative Medicine combines conventional and CAM treatments for which there is evidence of safety and effectiveness (http://nccam.nih.gov/health/whatiscam/). There are no contraindications to homeopathy, making homeopathy an ideal adjunct to your health plan. Our information is not intended to diagnose, mitigate, prevent, treat, or cure any symptom or disease as defined by the FDA. Cocculus Lightheaded Combo 30C in economy 1 oz bottle with 800 pellets for 265 doses. Pellets are in a base of sucrose and cornstarch. SUGGESTED DOSE: 3 pellets taken at one time as one dose. Use one dose 2 to 4 times daily. Anxiety Stress Relief Combo 30C 1 oz pellets Anxiety Stress Relief Combo. Specialty combination formulated by Kathryn Jones, Homeopathic Specialist. Anxiety Stress Combo is a unique formula to Elixirs.com. Formulated with 6 important remedies to address emotional and physcial symptoms from tension, restlessness, social anxiousness, work performance stress, apprehension and general stress, depression, emotional exhaustion. Use Anxiety Stress Relief Combo for stress headaches, tension headaches. Provides a blend of homeopathic remedies for emotional balance. Stramonium is included for tension headaches brought on by stress. Helps with feeling overwhelmed, out-of-control, strong emotions of anger, irrationality, mood swings, and fear. Helps with worry and emotional fatigue. Anxiety and Stress Relief Combo is useful for irritability and symptoms that are associated with PMS, Menopause. Stramonium centers and grounds us from anger and out of control feelings. Helps to calm so useful for insomnia, racing mind, overactive mental chatter at night. Helpful for children with ADD, ADHD type symptoms. Useful for bedtime fears. One in four Americans suffer from a form of anxiety, such as OCD-Obsessive Compulsive Disorder; GAD-Generalized Anxiety Disorder; Agoraphobia, PTSD-Post Traumatic Stress Disorders; phobias; PD-panic disorders. Continued untreated stress causes physical health problems. Anxiety Stress Relief Combo in 30C potency suitable for occasional or chronic symptoms. Economy 1 oz bottle with 800 pellets for 265 doses. Pellets are in a base of sucrose and cornstarch. Kathryn Jones' specialty COMBO product, purchase 2 or more mix or match for $1 off each COMBO product. Economy 1 oz with 800 pellets for 265 doses. Take one dose before activities that cause anxiety or stress. For chronic symptoms use one dose 3 times daily. MoodFix 60 capsules MoodFix combines fast acting homeopathic remedies and supplements to combat depression, sadness, free floating anxiety, and worry. Moodiness and stress can affect all aspects of a person's life. Mood Fix has been updated with 30C potencies for acute and chronic symptoms. A great alternative to addictive medications. MoodFix lightens moods. Mood swings affect all aspects of your life and make more difficult your ability to sleep, eat, work, and get along with others. Moodiness undermines your self-esteem, self-confidence, and your ability to accomplish everyday tasks. Even daily tasks can be a challenge. MoodFix lifts your day and encourages more restful sleep. Remedies in MoodFix can lift apathy and help you find increased motivation and interest in career and home. You don’t have to let daily stress, minor anxiety, fear, nervous tension, and irritability put a dark, gloomy cloud over how you see yourself, the world, and the future. MoodFix contains Ignatia 30C. Ignatia lessens grief, fear, sadness, anxiety. Mood Fix also contains Natrum Mur 30C and Sepia 30C for emotional balancing. Depression leads to fatigue, so Pulsatilla 30C has been added to increase interest and energy, lessen mood swings, everyday "blues", anxiety, burnout, grief. Also includes Gamma Amino Butyric Acid/GABA, a natural brain neurotransmitter that improves our moods, sense of well-being, relieves depression and calms our anxieties. GABA improves concentration, memory and clears the mind. Improves how you handle stress in the day and relax at night. Ingredients: Aconitum Nap 30C; Gelsemium 30C; Ignatia 30C; Natrum Mur 30C; Nux Vomica 30C; Phytolacca 30C; Pulsatilla 30C; Rhus Toxicodendron 30C; Sepia 30C and small amounts of Chamomile powder; Cyanocobalamin/B-12; Gamma Amino Butyric Acid/GABA; d-Calcium Pantothenate; DMAE Bitartrate; Gelatin; Glycerin; 5-Hydroxytriptophan; L-Theanine; L-Tyrosine; Magnesium Stearate; Motherwort; Niacinamide/B-1; Pyridoxine HCL/B-6; Riboflavin/B-2; Silica; Thiamine HCL. Manufactured by Natural Care, known for their outstanding blends of homeopathic remedies in supplement base. Homeopathy is a safe and effective alternative for improving mental health. 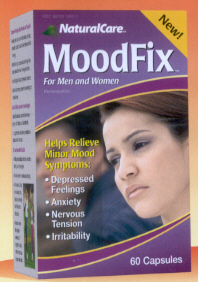 MoodFix is non-habit forming product. Can be used with other medications. No Picture Blood Tonic Combo 200C economy 800 pellets Blood Tonic Combo promotes general well-being. Can use Blood Tonic Combo for fatigue, recovery from illness, and anemia issues. Blood tonics may also be beneficial for aging issues such as aging skin and hair. Safe for all ages. Bone Marrow is included for bone marrow support. Supporting bone marrow function is beneficial for T-cells and immunity. Bone marrow is a spongy tissue found in various bone in the body. Bone marrow produces white blood cells to fight infection and red blood cells to carry oxygen and nutrients throughout the body, and platelets to aid blood clotting and healing. Phosphorus is included to support blood circulation. Phosphorus helps with circulation in the respiratory system so helpful for bronchitis, coughs, and asthma. Phosphorus helps with general fatigue, weakness, anxiety, irritability, slow recovery from illness. Kali Phos is a great tonic, known as the pick-me-up remedy. Kali Phos is from the mineral potassium phosphate, an important electrolyte for mental and physical energy. Potassium supports the adrenals to make Blood Tonic Combo ideal during stress. Contains no bovine or supplements. Economy 1 oz bottle with 800 pellets. SUGGESTED DOSE: 3-6 pellets in the mouth at one time as one dose. Improved circulation dose: One dose 3 times daily. Fatigue dose: One dose 3 times daily. Anemia dose: One dose 3 times daily. No Picture Circulation Combo economy 800 pellets NEW 10% SALE Circulation Combo is a new formulation by Kathryn Jones Health Counselor for ELIXIRS.COM. Circulation Combo is a blend of remedies for symptoms of blood pressure, cholesterol, headache, varicose veins, high blood pressure. Circulation Combo includes important remedies for blood pressure support such as Arnica, Belladonna, and Aurum Metallicum. Circulation Combo includes Cholesterinum for balancing cholesterol and for liver support. 80% of cholesterol is produced by the liver, People of any age or socioeconomic background can have high cholesterol. High cholesterol increasing concerns for heart disease, the leading cause of death in the United States. 1/3 of American adults have high LDL- the cholesterol that is undesired. Circulation Combo includes Stramonium to offset the energy zapper-stress. Stramonium helps with emotional and physical stress. Stramonium is listed for fatigue, blood pressure, arteriosclerosis, heat stroke, and sun headaches. Stramonium is great for Type A personalities and their risk for aggression, blood pressure and heart concerns. Circulation Combo includes Arnica and Belladonna to support circulatory concerns of hardening of the arteries (atherosclerosis). Some health professional feel Arnica naturally keeps the blood moving and is helpful for smokers who have thick sticky blood and therefore more at risk for blood clots. Belladonna is a common blood pressure remedy. Belladonna is useful for throbbing headaches, hard pounding pulse. Belladonna helps with symptoms that are worse with excess light, noise, or nighttime. Helpful for circulation issues or headaches where the face or head is hot, but extremities may be cold. Belladonna is listed for fevers and inflammation. Circulation Combo is in a potency blend called F potency with 6C, 12C, 30C and 200C together for deeper response for chronic circulation issues. Pellets are in a base of sucrose and cornstarch. 3 to 6 pellets can be use as one dose. Put pellets in mouth and allow pellets to slowly dissolve in the mouth. No taste pellets. For 1st aid treatment take 4 doses daily for 4 days. For chronic symptoms take one dose 2 to 3 times daily. No Picture Fatigue Combo 200C 800 pellets NEW New Fatigue Combo for physical or mental exhaustion. Use for recovery from illness. Fatigue Combo can be used for sluggish conditions, slow healing, chronic symptoms. Fatigue Combo improves recovery after exercise or work. Arsenicum Album for general weakness. Worse upon slightest exertion. Unrefreshed even after sleep. For respiratory symptoms - coughs, bronchitis, shortness of breath. Fatigue Combo includes Kali Phos for mental, emotional exhaustion. Nerves on edge. Exhaustion worse from mental exertion. Difficulty concentrating. Kali Phos has often been referred to as the pick-me-up remedy. And with good reason. Kali Phos is from the mineral Potassium Phosphate, an important electrolyte that is crucial for energy-mental and physical. Potassium supports the adrenals, so is helpful for stressful times that can overtax the adrenals. Kali Phos is helpful for tension headaches associated with intellectual fatigue. Mental fatigue with irritability. Fatigue Combo includes Ginseng for improved stamina, general energy boost. For weakness and coldness in the extremities. Voice feels rough, dry SPASMODIC cough, Vertigo. Mentally feeling cloudy, confused. Fatigue Combo includes Arnica for improved circulation. For depressed mental state during chronic illness. For poor nutrition with poor digestion and elimination. System feels sluggish, slow healing wounds, slow recovery from illness. Fatigue Combo includes Sarcolactic Acidum for muscle fatigue and general weakness following flu. Symptoms worse in the afternoon. Restless at bedtime. Sore throat. Weakness felt in back, neck, shoulders. All remedies in Fatigue Combo in strong 200C potency. Economy 1 oz bottle with 800 pellets. Pellets are in a base of sucrose and cornstarch. 265 doses. SUGGESTED DOSE: 3 to 6 pellets at one time as one dose. Slowly chew/or dissolve under the tongue. GENERAL FATIGUE: One dose 3 times daily. NIGHTTIME symptoms and/or symptoms that are worse in the MORNING: One dose in evening, 2nd dose at bedtime.